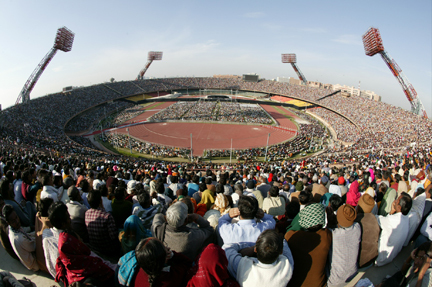 In an announcement that is likely to throw the cat amongst the pigeons, Network TEN and Foxtel have secured the television rights to the 2010 Commonwealth Games in Delhi, India. It is the first time TEN has secured rights to the Commonwealth Games since 1994 in Canada. TEN and Foxtel will share all broadcast rights, allowing both TEN and Foxtel to broadcast simultaneous live coverage of all events. Both networks will have coverage of the Opening and Closing Ceremonies, with TEN exclusively live. Many key events from the Delhi 2010 Commonwealth Games will be broadcast within Australian prime time zones. Following on from Nine winning the 2012 Olympic Games in London, it certainly ramps up competition between the three commercial networks. Network Ten and FOXTEL today announced they had secured the exclusive Australian broadcast rights to the 2010 Commonwealth Games in Delhi, India. The agreement will see TEN and FOXTEL deliver Australian viewers the most comprehensive coverage of this blue ribbon multi-sport event ever seen on Australian free-to-air and subscription television. TEN, who today officially won the rights from the Organising Committee for the Delhi 2010 Commonwealth Games as part of a competitive bid process, will partner with FOXTEL to broadcast the 2010 Commonwealth Games, from October 3 to 14 that year. Under this landmark partnership agreement TEN and FOXTEL will share all broadcast rights, allowing both TEN and FOXTEL to broadcast simultaneous live coverage of all events. Both networks will have coverage of the Opening and Closing Ceremonies, with TEN exclusively live. Importantly, many key events from the Delhi 2010 Commonwealth Games will be broadcast within Australian prime time zones. TEN and FOXTEL will also look to on sell the radio rights, with FOXTEL securing the exclusive subscription television and exclusive new media rights, including mobile, internet and digital video broadcast handheld (DVBH). The 2010 Commonwealth Games will also be the first to be host-broadcast produced in full High Definition. TEN last held rights to the Commonwealth Games in Victoria, Canada in 1994 and in 2010 will broadcast the most comprehensive free-to-air coverage of the event ever seen in Australia across its high definition, standard definition and analogue channels. FOXTEL will compliment TEN’s extensive coverage by offering its subscribers an expanded service that will provide an unparalleled choice of Commonwealth Games competition across all 17 sports. Network Ten chief executive officer, Grant Blackley, said: “Securing the 2010 Commonwealth Games rights reinforces TEN’s position as the industry leader in broadcasting premium High Definition sporting events. TEN will showcase the Commonwealth Games as never before across our HD, SD and analogue platforms. The Commonwealth Games will be broadcast in a highly favourable time zone attracting audiences and premium advertisers alike and will deliver TEN both outstanding ratings and significant revenue. FOXTEL Chief Executive and Managing Director Kim Williams AM said: “Australians have always enthusiastically embraced the Commonwealth Games which have consistently dominated Australian television ratings. FOXTEL is looking forward to redefining the way in which its subscribers watch this prestigious sporting celebration with unparalleled, high definition coverage of the entire games, the likes of which has never been seen before. Full details on how the TEN/FOXTEL partnership and programming offer will operate will be released progressively leading up to the Delhi 2010 Commonwealth Games. foxtel will get more ppl subscribing but just for the sport. u know u can buy packages! David, the real winner out of all this is Foxtel. By having the rights to both the Olympic and Commonwealth Games, Foxtel will attract more subscribers to their service, especially those who want the best coverage of these international events possible. In my eyes, Foxtel is shaping up to be the “fourth” major commercial force in Australian television. i think the games will do alot of good for ten. in regards of the games in melbourne, they rated very well.did well for melbourne, for ch9 and for the commonwealth!. maybe u were asleep when it was all happening or…on mars! Its not surprising that Ten won this one. Nine has no money left after paying for the Olympics and Seven still has to pay everyone for their failed C7 court case. Damn thats a blow for those of us that watch Ch10 more than 7 and 9. I can only hope that during that one of the other channels will have something worth watching. This is why there should be a separate channel for sporting events as to not get in the way of otherwise potentially good TV.